Introducing our littlest chicas, the Chiquitas. They are tiny balls of footed fluff. They hatched July 11th, and came home on the 15th. I've seen newly hatched chicks, and I still cannot imagine how tiny they must have been. In the foreground, and right behind her, are the two Ameraucanas. And the other four are Cuckoo Marans. The cutestness of them is mind-blowing. We swoon. We sigh. We announce, at regular intervals, Come and see, they are being so cute! Four of them look, effectively, the same. But, being a bit nuts, we are naturally, learning to distinguish them, and have even decided to name them. This will be interesting, if not mildly annoying. Chicks change. And. they. look. alike. We are so silly! On the left: She is the tiniest, has not a sign of tail feathers, and has more white than her sisters. She is Liberty. She stands apart, then calls out. She is a speck bolder, more independent than her sisters, and I think of her July hatching, Independence Day, and liberty. Facing her is the largest chica, an Ameraucana, with eyeliner. Maria and Amira dubbed her Totoro. Totoro is a friendly wood spirit, introduced in a Hayao Miyazaki film of the same name. Big name for such a chibi one! Cute, and trusting, and breathtakingly beautiful. Their markings, their innocence, the funny and charming things they do... they are beautiful. This is the other little Ameraucana. She's dark, and spicy. Maybe she is a Masala. We'll see. The Cuckoo Maran with the almost star shaped patch on her head, who looks like the other one! Our pretty, dark chica, with the spicy down. She has the least amount of white feathers on her head, and the children have been calling her Soot-Sprite. Like their big sisters, the Juniors, these Chiquitas took to the dirt with gusto, to scratching and pecking, like pros. Soon, we'll see more distinctions. Their personalities and behaviors will name them, too. And, assuming there are no roosters... and there are always roosters... we'll get the naming sorted out. These days will pass too quickly. It's so much fun to indulge them, and keep company with them. Of course they let us know when playtime is over, and a nice nap is in order. Back to their heat lamp, and cozy shelter they go. We adapted 7 new chicks the week of July 15th also! You're post crystallizes what we have been feeling also. So cute! 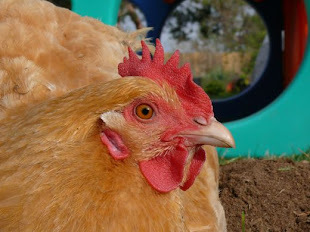 How about naming the Cuckoo Maran with the almost-star patch on her head JUSTICE? Like justice and liberty for all? Welcome home, Las Chiquitas, and get ready to be loved loved loved! Those feet are almost too cute to be believed.